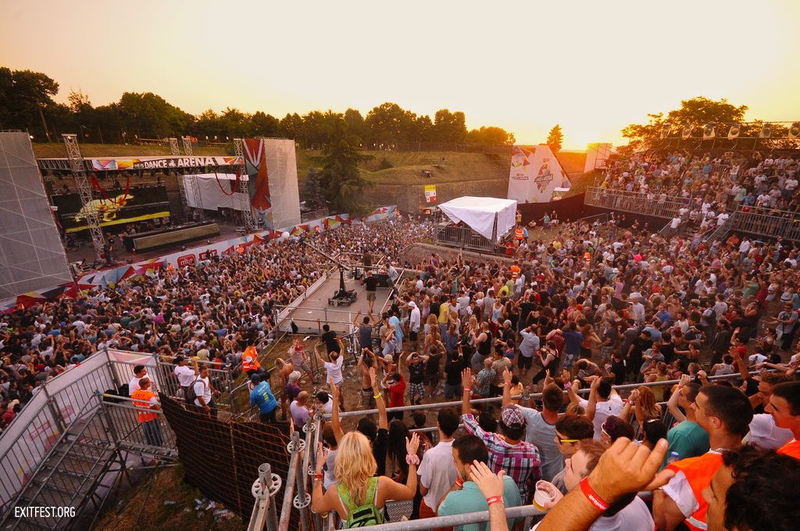 This weekend, the 18th edition of Serbia’s EXIT Festival kicks off in Novi Sad, in the south-east of the Balkan nation. In those 18 years it has grown into one of the world’s best-known and most respected festivals. As well as bringing some of the planet’s biggest pop and heritage acts to its stages, EXIT is also famed for its exemplary dance music bookings – over the years it has flown in everyone from David Guetta and Deadmau5, to Carl Craig, Green Velvet and Nina Kraviz to perform for the always buoyant EXIT crowd. And where do all of these electronic music titans perform? In a space that is, for us, one of the best rave spaces on Earth. Is It Really One of the Best on Earth?! Why, you may ask, is EXIT’s Dance Arena up there with, say, Space in Ibiza, or Berghain, or Stereo in Montreal, Barbarella’s in Croatia, or Womb in Tokyo? Well, first of all the stage is set up in a part of the sprawling Petrovaradin Fortress, in a man-made valley. In that valley, there’s enough space for 25,000 people, at least two-thirds of whom will be right in front of the stage on ground level. What makes the stage even more interesting is its upper tiers, which create an amphitheatre-like space, so you can be dance all the way up on high while looking down on the stage and the people partying below. Still not convinced? How about the fact that it goes on until 8 am, and sometimes even 9 if they’re willing to push it. Around 6 or 7 is when the sun starts to rise, over the crowd, bit by bit. Catching a sunrise while dancing to your favorite DJ right at the top of the tiered level in the Dance Arena is quite possibly one of the best experiences I’ve had at festival, on more than one occasion. It's consistently mind-blowing, no matter whether you're watching Steve Aoki crowd surf in a rubber dinghy or A-Trak close out the Dance Arena in temperatures of 95º F.
As soon as you’re at the midpoint between the Main Stage and the Dance Arena you can hear the basslines pumping. As you get closer anticipation begins to rise, and everyone around you is buzzing with excitement. Walking down that huge metal staircase and into the teeming arena is enough to send you into a frenzy, whether it’s in the middle of the night, when the awe-inspiring Dance Arena production and their sassy dancers are in full flight, or in the morning, when you’re confronted with a sea of half-naked ravers, fist-pumping so hard their sunglasses fall off – all refusing to stop dancing until the very last note is played (see Solomun's video from 2016's EXIT for evidence of that). This is not a stage that slowly peters out with just a few stragglers left at the close, this is the EXIT Festival Dance Arena, where everyone stays until the sweat-filled climax.